We came across this gem on Pinterest and just had to share it! Isn't it the cutest? Party decor or year round home decor (I'm thinking my baby girl's nursery?!) it is cheap, easy, and looks fabulous! Head over to oleanderandpalm.com for the full tutorial. "Buntings aren't dead yet. But, I'm trying something a little less country, shabby chic-ish, with this gold straw bunting. It's light and airy and almost feels like a piece of jewelry for your home. This Christmas, when we were in Boise, ID, the Anthropology store had a fabulous display made with straws painted gold. I've been wanting to make a scaled down version for my mantel ever since. 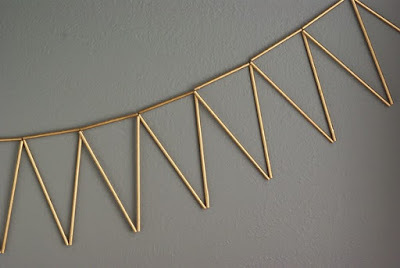 This simple bunting is season-less and can coordinate with any home decor or party theme. 1. You'll need lots of paper straws. For each triangle you'll need two full length straws and one half length. You'll also need some heavy thread or twine and a large needle.